Category: where did that come from? If you’re seeing this page, chances are you have followed a link to http://geobabble.wordpress.com. If so, you should update your bookmarks to http://blog.geomusings.com. I have recently moved my blog over to Octopress and no longer be actively maintaining this blog at wordpress.com. This site will remain online as there are many older links that point back to this URL, but no new content will be posted here. All of the existing content on this site has been migrated to the new location so I strongly encourage you to update any links that may still be pointing to “geobabble.wordpress.com”. If you experience any problems with linking to the new site, please contact me using the information on my “About” page and I’ll try to help resolve the issue. I was mowing the lawn today and trimming with the push mower pictured below. If it looks old, that’s because it is. I first acquired it in 1978 when it was given to me by neighbors that were moving to an apartment near the city, meaning they no longer needed it. It still starts on the third pull and I’ve used it every summer since it was given to me. As I was mowing, I thought about how old the mower is and how it came to be in my possession. This led me to think about the origin of my fascination with maps. What does one have to do with the other? Allow me to explain. As you can imagine, I was fairly young when the lawn mower was given to me. I had gotten to know the neighbors up the street by playing with their son. One day, I noticed a large shelf of identical, leather-bound books taking up the entire back wall of a room. I asked what they were and they invited me to browse them. It turned out that my neighbor was the son of a long-time chair of the National Geographic Society. These books were actually bound collections, by year, of every issue of National Geographic from the first issue on. Over time, I would spend hours poring through these volumes, fascinated by the world as it was documented by National Geographic from 1888 forward. I did not get to read every issue but I was especially drawn to the maps when they were present. I realize now that my identity as a “map nerd” took root there. Coincidentally, 1978 was the year I first started programming. Those two experiences turned out to be major influences on who I became. 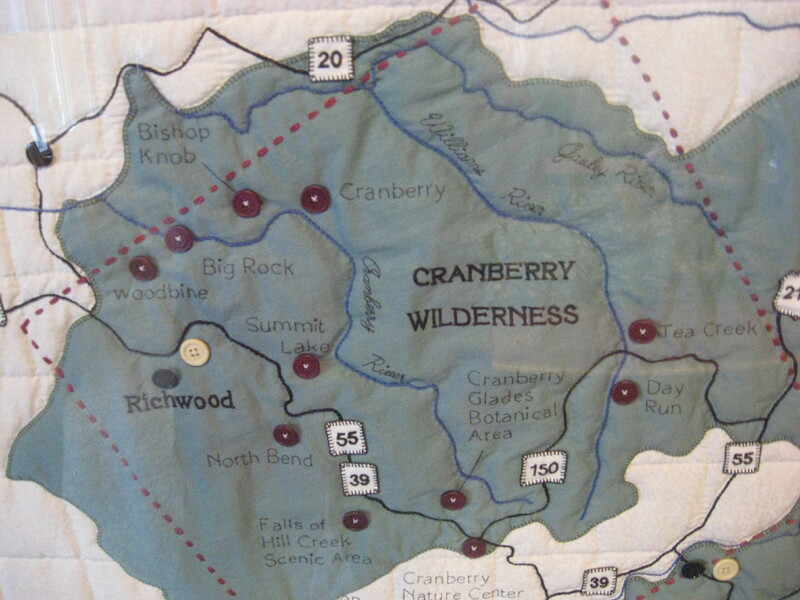 One of the rangers working there told me it is to scale (although the quilt itself lacks any indication of scale). 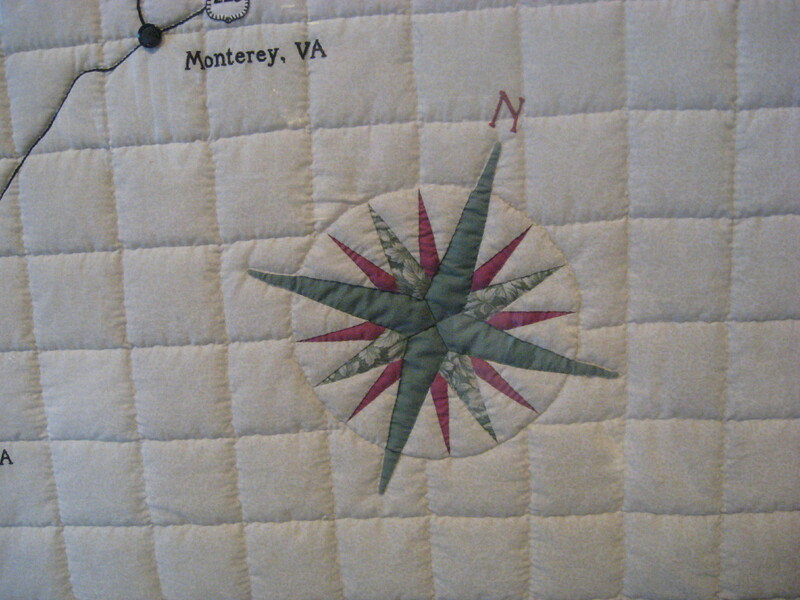 The next two pictures are close-ups showing the north arrow and the use of buttons as place markers. The kids we are traveling with were fascinated by this map. You will notice a red box over a portion of the forest. 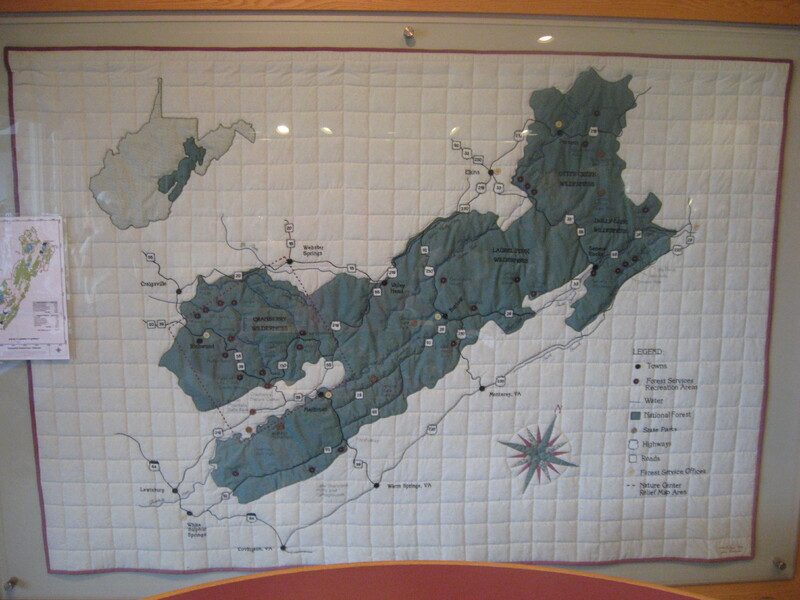 That was the area covered by a relief map on a table elsewhere in the visitor center. GIS Day is when the Great Map renders from its cache and slips around the world giving GPS units to all the good geographers. Does Vendor Lock-In Increase Health-Care Costs? Author Bill DollinsPosted on November 14, 2009 Categories soapbox, where did that come from?Tags diabetes2 Comments on Does Vendor Lock-In Increase Health-Care Costs? This past weekend, NFL Sunday to be specific, I was the victim of a TV/internet outage due to a mistake made by a technician while they did some work at the junction box shared by my next-door neighbor and I. As a result, I was unable to watch my beloved Washington NFL franchise hobble to another almost-loss so I had to find another way to keep tabs on the game. Since my internet service was also down, that left me with my BlackBerry Tour as my sole means of connectivity.